All this to say that I recently became frustrated with the Compaq, and having read your recent articles about the G4 and RAM upgrades for your Pismos got me thinking. So I contacted Wegener Media, since you found them helpful, and am now proudly running a 500 MHz Pismo with the extended battery and 1 GB RAM. It arrived very well packaged and also in great shape. Just a few gum marks from some old stickers I assume. I now know I should never have parted with my original Pismo. It is truly a great PowerBook, and with the PC Card slot has a lot of life in it. I'm running Tiger, and it seems to be handling it quite well. Just thought I'd share the story with you with your interest in the Pismo's. A tale with a delightful ending. I'm still greatly enjoying and appreciating my Pismos. Upgrading to 1 GB of RAM in one and installing internal AirPort cards in both of them has given the memory-maxed one especially a new lease on life. A machine I'd much rather use than a new PC netbook. Running Tiger, there's little to complain about speedwise for most of the stuff I do, although video support remains the weakest link with just 8 MB of VRAM. However the MacBook covers that base nicely. Thanks for the kind words and happy that you've got a Pismo again. I always read and appreciate the articles on Low End Mac. It was years before I finally gave up on my Apple II Plus and my Apple IIGS and bought a Mac - it was a WallStreet PowerBook, probably the best Macintosh of its time. By now I have a G5 with maximum memory as well as an Intel-powered 17" MacBook Pro, both running OS X 10.5.8. Every month I print my newsletter mailing labels on an HP LaserJet IIIp from an Apple IIGS using a program called "Addressed for Success" - the only Apple II program I still regularly use. And how do I get my updates to the Apple IIGS? From 3.5" high density floppies which are recorded on the WallStreet. The data get to the WallStreet via Zip disk, recorded by a Titanium G4 PowerBook, which is ethernet-connected to the Mac G5. While it would be possible to attach the WallStreet to the ethernet network, I have found over the years that it is incredibly slow and tedious to get the WallStreet (running 9.2.2) to talk to the PowerBook or the G5 or the MacBook Pro, all running OS X, so I no longer bother to try. The Addressed for Success program works well, the HP LaserJet works well, the Apple IIGS works well, and so far that's my preferred way to print mailing labels. When one of them finally breaks, then I'll seek a Mac label-printing solution. Jim - still happily living in a Microsoft-free computing environment. As a fellow WallStreet owner and enthusiast, I agree with you that it was the cream of the Mac crop in 1998 - and one of the best Macs of all time. Mine, in its eleventh year, is still in service on loan to my daughter. Thanks for the report on your workarounds keeping that very ancient Apple IIGS application useful. I still use some utilities and apps from 68k Mac Classic days, but the Apple IIs were before my time on computers. Looking at those prices, it might make more sense to pick up a used Power Mac G4 with dual processors. A few months back, a dual 1 GHz Quicksilver went for under $200 on LEM Swap. That's less than either of the CPU upgrades. Be sure to check Craigslist for local deals on secondhand Power Macs. You'll probably get a better video card in the process. I'm sure other readers will weigh in, so you'll hear from those with experience upgrading video cards as well. One of your correspondents wondered about what to upgrade in his 733 MHz Quicksilver. I had such a machine and went through just about all the possibilities. The first upgrade I made was the video. It had the same original card in it. After looking at the choices, I opted to flash an Nvidia GeForce 6200 from PC to Mac. Your reader might not want to do all that, but such cards are available on eBay for around $75. That made a huge difference in video performance. But the 733 G4 that came in that machine was such a dog, it's hard to decide which made the most difference, the GPU or the CPU. My solution was to buy a Quicksilver 2002 dual 1 GHz processor card and heatsink on eBay for just $144. Between the two, I've ended up with a machine that does just about everything quite well. I've been very happy with it, and my granddaughter is also happy with it, because Club Penguin (runs in Flash) is eminently usable, whereas before it didn't work at all. The last thing I did, mostly because I could, was to convert to a SATA disk and controller. These computers can only support SATA 1 because of the speed of the PCI bus, but even that is significantly faster than PATA. The machine is running Leopard (Mac OS X 10.5.8), and the drive change made a very noticeable difference in all activities related to disk use. I don't have the figures handy anymore, but one thing that is easy to measure is the fact that the machine goes from click (the "do you really mean it button") to total shutdown in just six seconds. In terms of overall performance, I have to say my observation is that OS X, including Leo, is a very much happier system on multiprocessor hardware. I also own a dual 533 DA machine, and that computer is a smoother, better performer than the stock G4 733 QS was. Thanks for the information and insights. Looks like installing both upgrades is the way to go. Three years ago, I bought a secondhand Power Mac G4 Digital Audio (2001) with a 733 MHz processor - essentially the same machine that James has. Shortly thereafter, I upgraded both its processor and video, using a 1.47 GHz Mercury Extreme G4 card and a Radeon 9700 Pro video card with 128 MB VRAM (PC version "flashed" to be Mac compatible). Now it's a decent machine for anything online - web videos play fine. Still chokes over large, high-quality videos playing from the hard drive (like a 2 GB, 1500-bit QuickTime movie), but for everyday work, it's all you need. If you have to choose, I'd go with the processor over the video card. In 2007, my upgrades cost me $280 (which included an absolute steal - $190 for the Mercury Extreme card). Today, the same cards can be had on eBay for $160 and $97, respectively, shipping included. However, I don't know if my 1.4 GHz G4 really has the horsepower to keep up with the video card (which was really meant for G5s, or at least dual-processor G4s). My processor still seems to be the bottleneck when I run it hard. So you could probably sink $150 or $160 into the processor and find a decent 64 MB video card for around $40 to $50, putting the cost of your upgrade at about $200. The other question is, as Charles pointed out, would you be better off taking that $200 and putting it into a newer computer with better baseline specs? If pure performance is what you're looking for, then it's hard to argue with a 1.66 GHz or 1.83 GHz dual-core Mac mini, which are going on eBay for around $325 to $400. Those Mac minis would run circles around even my upgraded G4, and their stock video, while nothing exciting, is still twice as good as what you've got right now. But of course they're far less upgradeable and might not be compatible with your older peripherals (not to mention OS 9, if you're still using those apps). But something to give some serious thought. Thanks for the report on your experiences. Personally, I would spend the money on a Mac mini, but I appreciate that there may be reasons why sticking with the more expandable and versatile tower machine would be the preference of some. The best YouTube performance increase I've seen was from simply downgrading the flash player installed in OS X. Neither Flash Player 10 or 9 want to play nice with older Macs, and many people unknowingly update to the latest and greatest player. To downgrade just go to: http://kb2.adobe.com/cps/141/tn_14157.html and pick the appropriate version of Flash uninstaller, then go to http://kb2.adobe.com/cps/142/tn_14266.html and download Flash Player 8. You will find the OS X installer in the latest version folder R42. After the downgrade, video and audio sync well on my iBook. My iMac G3 400 is actually bearable (but a little choppy) if you wait for the video to fully buffer. Potentially very useful and helpful information. Thanks for the advice and links. I'm not sure if anyone has pointed this out, but the original Mac keyboards actually had Backspace keys. This changed when the ADB keyboards came out, because the key was labeled Delete on the Apple II series machines. 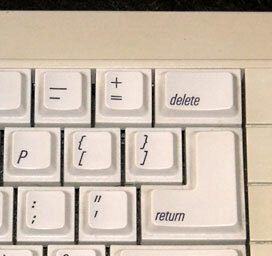 Since the ADB keyboards were designed to be interchangeable between the II series (although only the IIGS wound up using them) and the Mac, the Backspace key was renamed delete, much in the same way the "open Apple" symbol came to the command key. Apple II and III series machines that had Delete keys were all labeled Delete , although the Lisa had a Backspace key. Although marked Backspace on early Mac keyboards (left), it was Delete on the Apple II series (right). On a similar note, all Apples have labeled the Return key as Return. The Enter key has never been the same thing as Return , even on the original Mac. Thanks for the history tutorial! I read your helpful article, OS X 10.5.8 Update Provides Incentive to Get 10.6, that mentioned the multiple input device mouse dragging bug that was introduced in the 10.5.7 Mac OS X update and remained in Snow Leopard 10.6. I also use multiple input devices and find that this bug very negatively effects my computer work. Have you found a solution to this bug? I could find no other information about it after doing extensive searches. Thank you very much for and info. Unfortunately, I haven't found a solution, although I haven't been looking very assiduously lately, since I've been procrastinating about upgrading to Snow Leopard, and I figure it's a lost cause with Leopard. I would be very happy to hear from anyone who has found a solution, as the bug negatively affects my computer work as well. I hadn't seen it, and it is indeed an interesting article. Thanks for the link. For the iBook, they are on eBay right now. $10 plus shipping. Hey thanks. I can't wait to buy the iMac; pray things work well this month, which is my deadline to get it. It'll be wireless tech heavy with WiFi, RFID reader, Bluetooth, but will not have any drive for media, not even USB because you'll need to download ebooks, video, music, and apps from iTunes. Other companies will have infrared for it for their products (central control for your TV and lighting system for your house, for example), and of course companies who make sensors will make attachments for it (temperature, for example, and GPS). It's gonna be revolutionary, because it'll dominate almost every gadget that needs to be touched and not touched (voice, sound controlled, RFID). In short it's made a 10" square tablet become almost everything. It's gonna be big. It's gonna be the biggest thing that ever happened, thanks to multitouch primarily. Multitouch, software changeability and portability is the greatest combo. I hope you're right about it turning out to be a Mac "of a sort," but the latest scuttlebutt is that it will have an ARM CPU and run the iPhone OS, which is not encouraging. See this article from Gizmodo, which notes that the tablet will be basically an "iPhone on steroids." If this rumor is accurate, along with prognostications of a c. $1,000 price tag, I would say good luck with that, Apple. Yah. More secrets and philosophies on how the design will be. More to share, LOL. I hope it's okay with you. It's a little jumbled. If it's just a big iPhone or a big iPod touch and it's priced at 1k, that's not gonna sell, because people would prefer the MacBook with the keyboard, but I think it'll be less than $500. I have a philosophy and a design foundation that anything that mimics or virtualizes the real thing will never replace the real thing because technology is just really an extension of the real thing and our senses (that's why we will always have things like paper, books and keyboard). The only one that will go extinct is the mouse, because this technology is an extension of your finger (touch), but if you're already using your actual finger, then there's no need. But as long as you can touch, it could replace it, so I think yeah, a virtual keyboard would replace the real keyboard because it's not like a virtual keyboard that a cursor touches. Apple is on to something. I think they are trying to replace things that have physical input. I think their laptops will become tablets, since they know third-party people could create keyboard with casing for it anyway (the irony). Tablets will also be cheaper. I think the iSlate will have a normal keyboard layout like the wireless keyboard, but once held on the air it'll switch to something. I think it'll have the capacitive thing in it's body too, like the upcoming iPhone. I think it'll double as a small screen as well like the new iMac, but will only work with Macs by default including the Mini (again third-party people will make a case with keyboard for it - the irony). It'll be another transition. The CPU would be another transition from Intel to ARM by next year. The iSlate will have a pen also, because I feel strongly that it'll be a Wacom Cintiq with the hardware already on the screen, but I'm sure they licensed that wireless pen tech from Wacom anyway so Wacom will still live. It's 3 main clients are (since again the interface is changeable it's for all kinds of clients): digital artist (there's a bigger version for CAD people) coz' the size is just right at 10" which is the sweet spot size based on the netbooks and game people because it'll have more valuable than a PSP and a DS but will be more powerful and of course browser which is in itself as versatile as the tablet (it's got an OS, word processor, docs, etc.). Apple will be making asking publishers to make extreme games exclusively for it. It's thinner than the thinnest laptop in the world (VAIO). The price would be $434 USD, it's between the price of a Intuos4 medium and an Intuos4 large and fulfills the promise that "netbook" type portables will be lesser than $500. It'll have a more 3D interface that'll use the tilt sensors for speed scrolling done right (which is the hassle when it comes to the 50+ icons with iPhone and Touch, which are the testing ground for the tablet and it's interface) but not much more 3D, since even if you turn a cube using the tilt sensor as if you're turning a crystal ball or kaleidoscope filled with icons it'll stop at 2D (like now, we're steady looking at the screen, it's in some way 2D). I think it'll have temperature sensors as well that'll help with the pressure sensitivity of the tablet (more pressure more temperature) and of course you'll have a temperature thing in there for moms, weather, and hospitals (they just buy a third-party attachment for the probe). Since it's around 10" (but more likely it's around 9.7"), it'll have a good big decent pen. In the long term around a year, it'll cater more to gaming people, because it'll be a better value Nintendo DS, Nintendo Wii, and PSP (and as a game controller too for say your 27" iMac, which third-party people will make work with a TV, since current TVs will only need a receiver, because the iSlate is already a game console. In some games though like tennis, baseball, the Wii will still rule as you would be doing that motions with your thumb in the iSlate. Again the real thing can't be beat by a semi virtual design like multitouch and tilt sensors). Come to think of it, I feel it'll have a capacitive body because you'll need that as extra "buttons" to compete with say a PS3 controller or a Wii controller. What Apple has uncovered - the secret that other's have not - is that the power of sensors (multitouch is a sensor, same with the mic) is the best technology and the best extension of our own senses because it's the closest to mimic it and it's also changeable through software. Apple knows once you've established the soul/mind of these gadgets, which is the software (the one that does the thinking for the hardware) and establish the brain, which is the distribution (it tells the software where to go which is to Apple products) which is iTunes, then it becomes intelligent because it can adapt, since it's changeable (intelligent but not in itself, more of extension of our intelligence). And Apple knows what it lacks for some user, other parties will fill so it is not afraid to innovate mostly thanks to that sensor the multitouch. Not only is it not afraid to innovate, but it'll have bad sales because it offers preorders before they decide on the the volume to make. People will only preorder of course if it's a great innovative product. They can't lose with this system. It's gonna be big. Another secret they know is that the "cloud" will never be; the cloud is really just a back-up of what you have. Software in themselves are not really virtual, because they never became real for the most part (an icon is an icon, drop down menus are drop down menus, there's no equivalent in the physical world). You really have to have that same thing in their cloud (iTunes, App Store and Me.com) on your gadget (you have your email there still, your Apps, etc.). If you have control of everything, then it's cool (control of software, distribution, and hardware). With this I'm changing my mind that it'll be another Mac. I think it's not gonna be an iPhone OS though, which is very sluggish which is based more on the Desktop OS. Since this is gonna be multicore ARM with multicore ARM GPUs in one die and it's tested multi GPU on Nvidia on MBP, which isn't that efficient (it can afford to do that with bigger batteries, since it's big), it'll need more parallel computing, since it has to be network friendly in the light of the hacks today, it should use OS X Server, since the 4th and 5th users of these would be the military and the medical people, including med reps who need signature (6th would be the business people, coz' they test first after the rest) who need these cool iSlate to be networked to one another and maybe even doing parallel computing wirelessly or wired if need be. It also has to parallel compute with your Macs as well through wireless or wired. It's gonna be a great year for Apple and beyond :) iSlate will introduce new Apple stuff like independence to Intel, Nvidia, PDF, and ATI with ARM, graphics tablet, game console, eReader, which is really just a word since we read stuff on the net anyway, it should come with the multitouch iWorks as well, and since it's designing things with multitouch as the center and something like iWorks is important, it'll introduce a format that is not PDF coz' that one's not designed for multitouch (it's for a one touch cursor thing). I can't wait for this product :) I'd say iWorks and its interface would be redesigned to use all 10 fingers and beyond (tilt, pressure, and/or temperature). I don't think the interface would be like that of Microsoft's table, because those don't have tilt. Things won't just be scattered on the screen; it'll be more like an 8-ball toy or a Kaleidoscope (another secret Apple knows I think is that big multitouch will not work unless you can tilt it, you will still need a vertical monitor for large stuff) and that's tiring anyway (look at CNN, can't multi touch on a vertical screen for hours for sure). Thanks for listening. Hope you're right about the price and specs, but I'll be astonished (pleasantly) if it's priced at under $500. I'm still thinking it will have the iPhone OS. We'll probably see next Wednesday.